This Article is written to provide assistance and step-by-step guidance in resolving the Mitsubishi "Blinking Green Light" issue. This failure is often referred to as the "Blinking Green Light of Death" or BLOG. A large amount of information is included in this Article, all of which will help you to both understand and repair the 'Blinking Green Light' problem. Written specifically for the Mitsubishi 65" WS-65813, this article ALSO applies to other Mitsubishi models with the same 'blinking green light' issue. The Mitsubishi 'Blinking Green Light' failure is common with many Mitsubishi models including the WS-65813, WS-48513, WS-48613, WS-55513, WS-55613, WS-55813, WS-65513, WS-65613, WS-65713, WS-73513, WS-73713 and others. This detailed repair procedure will assist, even the NOVICE, in the required repair process. Links are provided for downloading Mitsubishi Service Manuals and for recommended parts ordering. Circuitboard photos are also shown which provide a visual reference during the repair process. I hope that this Article helps you to resolve your Mitsubishi "Blinking Green Light" issue. When I encountered the 'blinking green light' issue with my Mitsubishi 65" WS-65813, I called Mitsubishi's Customer Service Department. Following repeated promises to correct the issue, it soon became evident that they were both "dragging" their feet and not at all anxious to admit liability for this failure or to provide a timely repair of the television. After several phone calls to Customer Service, I sent a detailed letter to Mitsubishi Customer Service with a copy toÃ‚ Mitsubishi's President & CEO outlining my concerns and asking for a "good will" repair of my 65" Mitsubishi. After waiting about three weeks for Mitsubishi to assign one of their Authorized Repair Dealers to repair the unit, I repaired the television myself. Mitsubishi Customer Service did not follow up on the issue and I never received a acknowledgement letter from Mitsubishi's President and CEO. If you decide to repair the TV yourself, I recommend that you obtain a copy of the repair manual for your Mitsubishi TV from the Techlore website by going to Mitsubishi Service Manual. It will provide some direction, however it is technically written and may be difficult for the NOVICE to understand. If you are unable to locate the the service manual for your specific Model at the above Techlore link, you may need to purchase the service manual online at ServiceManuals.net. If you decide to have a service technician do the repair, insist that the "DM" module is removed from the TV and ONLY the four 1000uF, 16V Capacitors (Caps) located on the DM Module are replaced. MOST techincians will INSIST on replacing the entire DM Module and not simply the capacitors. The cost is about $200 for a technician to replace the capacitors and $1000 for replacement of the DM Module. As you will read below, doing the repair yourself will cost less than $4.00 for the 4 Caps. I repaired my Mitsubishi WS-65813 by replacing the four (4) DM Module 1000uF, 16V, 85C Capacitors. The basic tools and materials required were: Four (4) capacitors, soldering iron, rosin solder, wire cutters, phillips & flat-head screw drivers and pliers. Repair estimates, from a local authorized Mitsubishi Repair Center, was between $800 - $1000 to replace the DM Module. My total out-of-pocket cost for replacing the four (4) capacitors was $3.50. Replace the original four (4) 1000µF, 16V, 85ºC capacitors on the DM Module with Radial Polarized, 1000µF, 35V, 105ºC Capacitors. Description: Computer Grade Electrolytic Capacitors or High Temp Electrolytic Capacitors; Capacitance = 1000µF; Voltage = 35 V; Operating Temperature Range = - 20º C to + 105º C; Termination Style = Radial, Operating Hours = 10,000 Life Hours. The original DM capacitors are rated at 1000µF, 16V, 85ºC. Do not use capacitors with this rating to repair your Mitsubishi television, or else the same issue will reappear in 1-2 years. The capacitors are available from several on-line electronics stores and possibly from a local television repair shop. I recommend that you use ONLY high temp Capacitors rated at 105º C, with a voltage rating of 35 V. Refer to the "General Information" section below for additional information about purchasing the capacitors from a online website. If you decide to take on the repair project yourself, pay CLOSE attention to my "Lesson Learned" note; a copy of which is provided below. This was posted to TechLore on October 4th, 2007. See comments below. Lesson Learned: Larry, For your information and others, after replacing the 4 capacitors on the DM Module, I slid the DM circuit board back into the metal DM case and then inserted the entire unit into the main circuit board. This was working in the "blind" as it was impossible to verify a proper seat of the DM circuit board onto the mother board. The blinking green light was still present upon power-up of the TV. I again removed the DM module from the TV and this time I re-installed the DM circuit board onto the main mother board and THEN installed the DM metal case over the top of the circuit board. By doing this, I was able to ensure a proper connection of the DM board. Upon power-up the TV is UP and RUNNING. Keep yourself "grounded" when working with the circuit board. Static electricity will destroy electronic components. When replacing the Capacitors, press them "down" onto the circuit board as far as they will go, hold them down, solder into place and clip the excess terminal lengths flush with solder. Only by doing this will the metal shield (little silver box) slide down and over the circuit board during re-assembly. There is not a lot of clearance when doing this, as the 105C Capacitors are slightly longer that the originals. With minimal effort everything does fit back together. Use ONLY 105º C capacitors with a voltage rating of 35 V.
Re-insert the DM circuit board into the Mother board; press virmly and ensure a proper seat of the DM board. Next, slide the metal case down and over the DM circuit board. Refer to my "Lesson Learned." Normal Power-up Sequence: During TV power-up, the green light blinks until the Digital Modulator (DM) has booted up and is in sync with the microprocessor. Once the two are in sync, the television will "turn on". A failure in this boot up process is indicated by the "blinking green light" continuing to flash and the television's failure to "turn on". Problem: Continuous "blinking green light". Mitsubishi television will not "turn on"; no video and/or audio; no audible noise or sound from the TV. Blinking green light will extinguish ONLY by unplugging the Mitsubishi from its power source. Press the "reset" button and hold for 10 seconds .... Does TV turn on and blinking green light turn to solid green. Unplug the TV from it's power source for various times, ranging between 5 minutes and 24 hours..... Does blinking green light continue upon plugging in the TV. Disconnect ALL devices from the TV; DVD, Tuner, Cable Box, unplug the TV for various duration times .... Does blinking green light continues upon plugging in the TV. Press Power and Menu buttons simultaneously and hold depressed for 20 seconds .... Does blinking green light continue to flash. Press Power and Display buttons simultaneously and hold depressed for 20 seconds .... Does blinking green light continue to flash. Insure that no front panel buttons are inadvertently stuck in an "engaged" position. DM Module Capacitors have FAILED. Perform a Mitsubishi "error code" diagnostic check to assist in determining where the problem lies. Refer to your Owner's Manual for specific procedures on running this check. You may also read Mitsubishi Television Error Code Diagnostic Procedure which is posted on Techlore's website. For this repair you will need a Phillips screwdriver, a 15 or 25 watt soldering iron, a desoldering tool (recommended), and four electrolytic capacitors. For the optional fan replacement you need a PC cooling fan, zip ties, foam tape (or weather stripping) and a 12v AC to DC power adapter. Note: The cooling fan is not required provided you replace the capacitors with Caps having a 105c high temp rating. I recommend replacing the original (bad) 1000µF, 16V, 85ºC capacitors with Panasonic 10,000 hour, Radial Polarized, 1000µF, 35V, 105ºC high temp capacitors. The Panasonic Part Number is EEU-EB1V102. The capacitors may be purchased from a local electronics repair shop or online at digi-key.com. The Digi-Key Part Number is P13126-ND. If you require a soldering iron, I recommend Radio Shack's 15 Watt Soldering Iron, Part # 64-2051 or the 25 Watt Soldering Iron, Part # 64-2070. Radio Shack also has a desoldering tool, Part# 64-2060, which you may find helpful in removing old solder from the connections, without damaging the board. A basic 11 piece Electronic Tool Kit, Part # 64-2803A may also be of value. The cost for each of these tools is between $10 and $20. Similiar tools are also available from Lowe's, Home Depot or Wallmart. This is a fairly simple repair for those with a little soldering experience. Start by unplugging the TV. Disconnect the coax and digital audio cables and remove the rear panel. Remove the plastic panel mounting screws and set the panel aside. If you are going to install a fan, position it on the right side of the shield (as seen from the rear) and mark its outline with a pencil. It is easiest to install the fan with the shield removed from the TV, but by marking its mounting position first, you will avoid placing the fan on a part of the shield that has an obstruction. The DM guide partly covers the capacitors that need cooling and the metal tray under the CRTs also restricts fan placement. Unplug the USB and Firewire cables from the top of the DM, as well as the cable that runs from the front input jacks to the connector on top of the terminal board. Unscrew the grounding strap from the top of the doubler shield. Remove the 2 screws in the plastic bracket that holds the DMÃƒ Module in place. After removing both screws, pry the plastic piece away from the support piece to which it is mounted. The DM Module and the shield are removed vertically. In order for there to be enough clearance, the chassis needs to be pulled toward the rear of the TV. All the electronics are mounted on a tray that can slide back like a drawer to make servicing easier. Remove the board slide, which is a narrow fiber board that stretches the width of the TV above the rear of the chassis and shields the light box from scattered light. It is held in place by a long black screw on either side of the TV. Use caution as the board may fall when the screws are removed. Release the chassis lock tab on either side of the chassis. The tray may be a bit hard to slide, so alternately tug on the left and right edges to rock the tray rearward. Go slowly in case you've missed freeing a wire bundle. Pay attention to the large red anode wires and other cables on the right hand side as they are clipped to the frame of the TV. Pull the chassis back until the DM shield will clear any obstructions above. Remove the screws holding the DM shield. (Note: Do not use a power screwdriver on these screws as it is very easy to strip the threads.) There are two on top of the shield, two in the rear base, and one in the middle of the base on either side of the shield. The DM shield can be snug and hard to pull up. Gently rock the shield front and back while applying upward force. You may want to hold down the board below (DTV-TUNER) to avoid disturbing the ribbon connectors to the signal board. The DM itself also comes out straight up, but it is not nearly as tight. Remove the DM Module by pulling it straight up (toward the top of the television). DO NOT pull it at an angle. The DM Module is connected to the circuit board by 4 sets of pins. Once the pins are free from the onboard connectors, continue pulling straight up. There is a plastic guide that makes it necessary to pull the DM Module straight up and sliding it over the plastic guide. With the DM Module removed and positioned, as shown in the photo below, remove the 2 screws located next to the USB and IEEE-1394 jacks and slide the DM circuitboard out of the metal case. The next and most important task will be to carefully remove and replace the 1000µF, 16V, 85ºC capacitors with 1000µF, 35V, 105ºC capacitors. CAUTION: Handle the DM circuitboard by the edges to avoid static damage. If you hold the DM with the components facing you and the external connectors on the left, you can find the capacitors in question in a cluster on the top right corner of the board. The top of the capacitors shown above may only have a slight bulge, but they have indeed failed. Insert all four capacitors as close to the board as possible. The Panasonic capacitors are 4mm higher than the stock capacitors and there is very little extra room inside the shield. If properly installed, the DM Module case will fit over the DM board during re-assembly. The picture below shows the underside of the DM board after the capacitors have been removed. With the BAD capacitors removed, thread the new capacitor leads through the holes in the DM board. Ensure that you have the positive and negative leads on the capacitors threaded through the proper hole. With the capacitors in place, maintain pressure to firmly seat the capacitors against the circuit board and carefully solder each connection. It will help considerably if someone provides assistance during this very important soldering step. Replace the original 1000uF, 16V, 85C capacitors with Radial Polarized 1000uF, 35V, 105C Capacitors. If you are going to install a cooling fan, do so now. Once again, if you have used capacitors with a 105ºC temp rating, the cooling fan is not required or recommended. If installing the fan, stick some foam tape or adhesive weather stripping to each corner of the fan. This will minimize fan vibration noise and provide the fan with some clearance from the shield. The shield has a thin ridge that runs diagonally and prevents the fan from sitting flush, but the foam tape will allow the fan to straddle the ridge. Place the fan on the pencil lines you drew earlier and secure two diagonal corners of the fan with small zip ties through holes in the shield. The zip ties are flat and their low profile will allow the shield to slide over the DM board without getting caught. You can run your fan from a 6v power supply to minimize noise, but test it first since not all PC fans will spin up with just 6v. For individuals with the Mitsubishi WS-55859, WS-55909, WS-65869, WS-65909, WS-73909 or other Mitsubishi models with seven (7) of the 1000uF, 16V Capacitors on the DM Module instead of four (4), the two photos below may provide a visual orientation when looking at the DM Module circuit board. In this case replace all seven of the original capacitors with those having a rating of 1000uF, 35V, 105C. Installation is the reverse of removal. The DM will slide down onto the four connectors at its base and there is a plastic vertical guide to ensure proper alignment of the board. Be careful not to bend the copper grounding springs that touch the connector end (rear) of the DM as it slides back into place. Carefully slide the DM shield back over the DM board and be careful not to snag the taller capacitors. Install the 6 screws that secure the DM in place. (Note that the two screws on the top of the DM shield are different from the other four). Plug the PWB-DEMOD card back in and ensure that its copper ground spring is touching the left edge of the DM shield. Slowly slide the chassis back into the TV and be careful not to pinch any wires running to the front of the TV. The chassis should click as the release tabs lock into place. Secure the chassis with the long black screws. Reconnect all the wires you had removed and secure the excess slack back into the wire ties. Plug the USB and Firewire connectors back on the top of the DM and plug the cable from the front inputs back onto the top of the terminal board. Screw the grounding strap to the top of the doubler shield. Do not over tighten it as it is easy to break the threaded mounting plate on the shield. Install the DM rear cover and screws. Reconnect the coax antenna and digital audio cable back into the DM (if applicable). Lastly, put the board slide back and remember that it could fall unless properly screwed in place. Double check all the connectors on the boards to be sure you haven't missed reconnecting anything. Install the rear cover of the TV and route the optional fan's power cable over the top of the rear cover to avoid pinching the cable. Plug the TV back in and the front light should blink for about a minute as the DM boots. When the light has turned off, power up the TV and verify operation. If all goes well, your TV should boot in about one minute and there should be no more interference in the picture or OSD. For those more technically inclined than most, you may enjoy the following. For the rest of you, IGNORE these checks. CHECK FOR 12 VOLTS DC (AC-OFF DETECT) AT PIN 3 OF PC9A21 IF MISSING REPLACE PC9A21 PART # 268P058020 ON THE POWER PCB. SHORT DETECT SHUTDOWN (PIN 13 OF IC700) CHECK FOR OPEN L902 PART # 351P155010 OFF Q904 C (15 V SUPPLY) ON THE MAIN PCB. SHORT DETECT SHUTDOWN (PIN 13 OF IC700) CHECK FOR SHORTED D913 PART # 264P722010 AND OPEN Z901 PART # 283P039020 (Z905 AND Z900 M.
CHECK FOR BAD CAPACITORS IN DM MODULE. CHECK FOR 10 VDC AT PIN 5 OF IC502 OF LOW, CHECK IC503 PART # 270P704010 ON THE MAIN PCB. SUSPECT SHORTED WINDINGS OF T5A31 PART # 349P216010 ON THE MAIN PCB. CHECK FOR OPEN FUSES F9A04 AND F9A05 ON THE +24 AND -24 VOLT LINES. IF THE FUSES ARE OPEN THE CONVERGENCE OUTPUT CIRCUIT WOULD BE SUSPECT. COOLENT HAS LEAKED ON THE MAIN BOARD FROM THE CRT'S AND HAS DAMAGED THE MAIN BOARD BEYOND REPAIR. Also, if the 24 volt B+ and or B- is missing from the convergence ICs, change both convergence ICs as well as the defective pico fuse in the power supply. This is most likely not a quicky type of repair. These are a few of my notes on this set from me and a few of my buds in the buisness. Good Luck and let us know how you made out with this set. To all of you who may be attempting the capacitor fix on their Mitsubishi a word of caution. Modern circuit boards are easily damaged by static electricity. Tech's in the industry use grounding wrist straps when handling these boards. Simply walking across a room with the circuit board in your hand could damage it. Try to ground yourself to the metal chassis of the tv when touching circuits. Even though the TV is not plugged in it will equalize your electrical potential. Handle the circuit board carefully by the edges when taking it to your workbench. Try to ground yourself while soldering on the board. I bring this up after reading some posts that stated after changing out the caps they ended up with new or different problems. That's why you see new circuit boards shipped in the anti static special plastic bags. Could be poor solder connections, the power coming to the DM board from the main power supply could be bad. The power supply or sweep power supply could have bad connections or swollen capacitors. The first thing to do is check all of the plugs, connectors, and connections to and around the DM board. Next would be to check for other large capacitors on other boards with swollen tops. The next thing would be to start checking power supply upon switch on. But, first do the diagnostic test as explained in the service manual. Maybe it will point you in the right direction. If you have taken the time to follow these advance trouble shooting instructions and the Blinking Green Light continues to be a issue, a service tech may be required to complete the repair. I hope that this Article has provided guidance and assisted in the repair of your Mitsubishi's "Blinking Green Light" issue. If you require additional assistance or advice, feel free to send me a private message. Great article! I can see you have put a lot into it. I would suggest you put at the top which models of the Mitzu you are talking about. I was not sure if this concerned the one I have or not. I have a Mitsubishi WS-65819 with the same green blinking light of death problem. The electronics on my TV are different from items you have listed for the 65813. Do you have any special procedures for my TV? Any ehlp would greatly be appreciated. I am having the same blinking light problem on my WS-65869. I'm going to order the capacitors before pulling the board. The part number in your article is for a 16V cap. The cap is described in the arlicle as a 35v part. Which cap should I order? The correct replacement capacitors are 35V. If purchased from http://www.digikey.com, the part number is P13126-ND. Price per capacitor is $0.96. You may find the capacitors at Radio Shack or from a local TV repair shop. Quite often TV repair shops have a supply of various capacitors and generally don't mind selling a few to a good customer, even if they do not have a retail outlet. After reading your article I checked my fuses as stated in line #8. They are bad, so now is there a fix for the convergence board? Or what is my next step? My model TV is WS65909 with blinking geen light. Define the EXACT problem you are having. It may be a convergence issue where the pictures appear like a 3D effect. Are the colors all separated. If so, open the back side of the TV and gently remove the middle board and check the two IC's. Inspect VERY closely for soldering cracks and lose contacts. Resolder any questionable areas. Check the two Pico fuses once again. Your convergence IC's may be giving up or the solder joints may be cracked due to excessive heat. If you lightly bang your TV or maybe a little movement on the floor, those IC's may temporarily reconnect again and your TV will return to normal. Turning the TV off, allowing it to cool down a bit and then turning the TV back ON, you will see that 3D effect once again. If the Pico fuses,F9A04 AND F9A05, are BAD you may order them from MCM Electronics @ 1-800-543-4330. The fuses are 4 and 5 amp respectively. The IC board may also be purchased from MCM. For further troubleshooting, press MENU and INPUT, hold for 6 seconds. Take note of the blinging code sequence. You will see something like the timer blinking twice, then pause, then blink twice again, then pause, then stop. Advise of the results. Thanks for your quick response. My EXACT problem is the TV stopped working while it was on and being watched. After that when you tried to turn it on the green light blinked for about 2 sec. and stopped and was off. After unplugging the set for 5 min. and plugging it back in the green lite would flash for a min. or so and stop, then it would go through the same cycle as before. I had a TV tech come out and tell me that the Power bd. is bad. He was going to replaced it, but he called later and said he couldn't replaced it he would have to repair the old bd. So now I figured I would try my hand at it. I checked your instructions and found that the two pico fuses are blown (F9A04 & F9A05) and resistors R8C05 thru R8C46 measure two Ohms instead of 3.9 ohms. Resistors R8C07 thru R8C47 are OK. I don't know how to check my coils L8C01 & 02. I was going to order the output IC IC8C01, the pico fuses and 12 resistors. Do you think that will take care of my problem?? I suggest you also check for 12 volts DC at pin 3 of PC9A21. 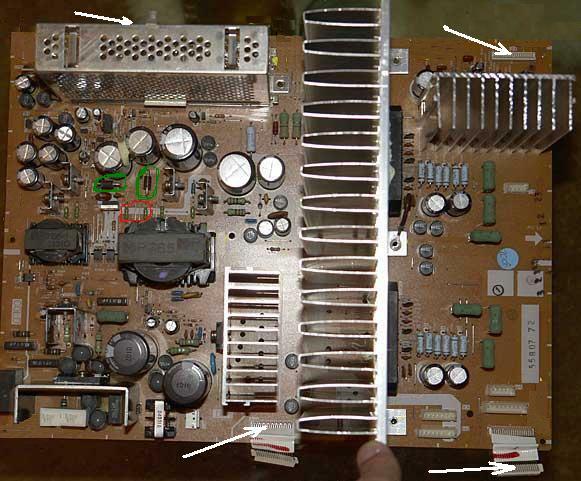 If bad, replace PC9A21, Part Number 268P058020, located on the Power PCB. Additionally, inspect for a Leaky C9A60, located parallel to D9A57 on the Power PCB. If the Pico Fuses are OPEN, the Convergence output circuit is suspect and you will likely need to replace the Output IC. Advise regarding results of pressing MENU & Input buttons. Thanks for the advice, I will do it when I get home and let you know. This photo may be useful as a reference for your convergence issue.. Fuses are highlighted with a red circle, Diodes with a green circle and Connector pins with a white arrow. Pico Fuses, F9A04 AND F9A05 should read +24 and -24 volts. The fuses are 4 amp and 5 amp respectfully. Diodes should read +26 and -26 volts. Ensure that ALL Connector cables are properly seated. Speed - I just found this site while crying over my Mitsubishi WS-65869 blinking green light. I have not yet begun the repair process, but wanted to tell you how much I appreciate your time and thorough instructions. I am almost looking forward to the project. Good luck with the repair. Advise if you have additional questions and let us know when you are up and running. Thanks again. I grabbed the convergence info as well. Will probably not have a chance to tackle this project until Sun or Mon. Will keep you posted- thanks! The 50V parts not only keep the Hi-temp 105C specification but more than double the Permissible Ripple Specification over the other parts that were specified. This provides for even greater margin and reliability. Pull the full datasheet (http://www.panasonic.com/industrial/components/pdf/ABA0000CE108.pdf) off of DigiKey if your up to it, Look for similar specification improvements if your buying locally, or contact www.Techlore.com Member: CalRich for questions. Use RTV to tack down the caps. This setup eliminates the metal shield clearance issues found with the 35v caps installed in standing up position. Voltage rating tells how much voltage the capacitor can withstand. It does no harm replace defective capacitors with those having a higher voltage rating and in fact this is a recommended procedure among circuit design experts. For instance, it is fine to replace a 16V rated capacitor with a 35V one, however there's no substantial advantage in buying capacitors with voltage ratings vastly higher than the originals. The Mitsubishi television will not work any better with 50V capacitors than it does with 35V capacitors. There is usually no problem when using a capacitor rated for a higher voltage in a low voltage circuit, however, some experts claim: You can run an electrolytic capacitor at any voltage below its rating safely, but if you go significantly below its rating and operate at this voltage for a long time (year or more), the capacitor will gradually lose its original rating and approach the minimum voltage rating needed for operation in the circuit. I do not agree with the above statement, however, I see no valid reason to overprotect a design circuit by using capacitors with a excessive voltage rating. My recommendation is to stay with the 35V capacitors and not to use 50V capacitors. Additionally, I find it preferable to keep the capacitor leads as short as possible and the capacitors positioned in a "vertical" position on the circuit board. I'm confused about something. I've pulled the DM out of my TV, and these four capacitors indicate 16v on them. Not 35v as mentioned online. Please advise. Replace ALL 4 capacitors with those having a 35V rating. Two (2) issues with the Mitsubishi DM design circuit is the temp rating and the voltage rating of the capacitors. Both design specifications are under valued. Thanks so much for the reply. I purchaced the 4 35v capacitors and am atempting to install them this evening. I replaced the IC convergence chip, two pico fuses and some resistors on my Mitsubishi TV, model WS65909. I have two bad diodes I would also like to replace. They are d9a60 and D9a61 located on the power pcb. Can you tell me the part numbers or the ratings so I can order them. Download the Mitsubishi WS-65909 Service Manual, select "Parts and Ordering information", scroll down to DIODES, located around page 59 of the Service Manual. There you will find the Diode part numbers for D9A60 & D9A61. You may want to save this link for future reference. Thanks again for you quick response. Regarding the diodes I need (D9A60 & 61), I am having a hard time finding a part number that's why I came to you. I did download the manuals for my model TV (WS65909) as you suggested earlier and I went to the parts list on page 50. I see the listing for the diodes but it doesn't list the two numbers I'm looking for. The list goes from d9a58 to D9A64. I am very confused why the two diodes I need are not listed. I looked on the schematic and found the diodes and their coresponding numbers but now I'm at a loss. Please help. I'm not sure why the Diodes are not listed in the Parts Section of the WS-65909 Service Manual. In any case, here is the information you requested. Note that the Diodes are identical. The S3L20U is a "Generic" reference number for the Diode. The Diodes may be ordered from Mitsubishi Electronic Parts Dept @ 1-800-553-7278. Cost is around $10.00 each. Diodes may also be ordered from Digi-Key @ 1-800-DIGI-KEY or online @ www.digikey.com. I believe that the part number at Digi-Key is: FR303DICT-ND. If you visit their website, enter FR303DICT-ND in the "Part Search" window. Read the specification sheet carefully and ask questions, as I am not 100% sure that this is the correct substitute diode for the D9A60/61. Digi-Key cost for the Diode is about $0.47 each. For those with Mitsubishi WS-xxxxx television issues, go to the thread below to post your comments, ask questions and to receive assistance with repairing your television. If you have a different Mitsubishi Model, such as WD-xxxxx, WT-xxxxx, VS-xxxxx, or your television brand is other than Mitsubishi, visit Techlore's "Televisions and Projectors" Forum and locate the Thread that is most applicable to your television brand and model. Techlore is my hero now. I followed the directions and was able to fix my Mitsubishi 65813 "blinking green light of death". 2) Because these capacitors are longer I did the same thing as in Rich's picture where I turned them down sideways to fit so they would not ground on the case. 3) I did purchase the soldering and desoldering items from Radio Shack and they worked perfectly. I also used these on other things around the house that I had been putting off so I figure I got my money out of them beyond the TV fix. 4) Tip - I took blue painters tape to mark all of the wires I unplugged and my wife wrote them down and we numbered them. Made it easy on reinstall because went counted back down to 1 to ensure we did not miss anything. 5) Tip - While I was in there I took the time to wipe four years of dust from the three lens with just a cloth I use for my regular glasses. Overall process end to end took me almost two full hours. I had this fixed and ready to go on Sunday for the two final playoff games. TV came right on, picture looks brand new again since the lens' were cleaned. Total bill for this was $30 and two hours of my time. Many many thanks to all who provided information on this fix. 1) DON'T USE Radio Shack crap capacitors! Please state your expertise before giving the above advise. As an electrical enginneer for 35 years iI find that your advise is off base. You SHOULD NOT be telling people to change capacitance values! ONLY REPLACE 1000uf with 1000uf CAPACITORS, as capacitance values are chosen based on the ripple frequency to be filtered. Without analyzing and engineering the circuit in context, you have no idea that changing values is OK. YOUR ADVISE ON HIGHER VOLTAGE CAPS IS ABSOLUTELY WRONG. HIGHER VOLTAGE CAPS PROVIDE ADDITIONAL RELIABILITY FOR THE PART IN THE CIRCUIT. When a Cap is used close to it's max voltage rating it will have a certain life expectancy based on the circuit voltage being close to the max rating of the part. If you use a part with a higher max voltage rating (say 35v) and the circuit voltage is only 16v then the stress on the 35v part will be less because it is not being used close to its max voltage rating. This means that the 35v parts will have a longer life. The reasons for this is that the 35v part is physically larger and has better insulation between layers. This prevents breakdown and dissapates heat better which will factor into the longer life expectancy. I have 30 years experience as a TV Repairman and I am a head road technician for a Mitsubishi authorized repair shop. According to what I have heard from TV Engineers is if you have a capacitor of 35Volt rating in a circuit with say just 5 to 10Volts the capacitors will tend to dry up (because its almost like the capacitor is just sitting on a shelve somewhere) and capacitors do have a short shelf life. Now I'm not a capacitor engineer but I'm inclined to believe the mfgs engineer. And I've heard this from many other TV engineers. Personally I don't know if its true or not I've just been told that. The info about the capacitors is straight from Mitsubishi: replace capacitors with 680ufd 16v 105c capacitors ONLY. That is a direct quote from Mitsubishi's own service bulletin! Enter 'EEU-EB1V102' at lower left. Go to advanced reply and immediately attach and share a .pdf of the full Mits Service Bulliten so that we can read the full text and determine proper application, models and boards involved. ( or send it to panitz_r@pacbell.net and I will help get it distributed). Mits is not disclosing the true nature of the problem so published info on the move to 680uf would be significant. IF Mits engineering determined that voltage, permissable ripple, temperature, impedance, and other margins were not a factor in the failure then it would make sense that they would likely stick with the 16v as the worldwide repair recommendation. Normal practice would dictate that once you achieve proper margin to specification then you do not need anything bigger, but bigger is still allowable. And you will see that the caps still have to meet thier full endurance specification even after 1000 hrs storage at rated temperature. The information that you have been getting on voltage is absolutely wrong and is simply HEARSAY. If it were true Manufacturers' would have to specify the lowest working voltage for which the 35v cap. would meet life expectancy. Sounds kind of silly dosen't it? Hi Speed! Simply super on the DM cap replacement instructions. Pretty much went as expected EXCEPT. I got it all back together and did a victory dance when the set started working again. In about an hour, it went back to blinking green light. I am at a loss for how the fix could come "unfixed". All seemed to work fine and I even turned it on and off a couple of times to make sure. Then the green light of death returned. Seems obvious that if the set came back on, the fix must have been executed right or else would have either blown up right away or would not have worked at all. Help? Sorry, I see Speed is not on this thread...I am open to help from any of you guys. I did use the 1000uF, 35V, 105C caps from Digikey, Panasonic ECG EEU-EB1V102 ordered by P13126-ND (Digikey number). They fit upright...barely. Also when repaing DM boards if the set is a one of the WD series there is caps also in the FM board that are the same 1000 ufd 35V caps as the DM board. If you want to use 1000 ufd 35V 105C its probably Ok but I would go with the smaller caps myself. The Mitsubish Service Bulletin that Dave refers to, in a prior posting, is NOT a Bulletin, rather a "Service Tip" issued by Mitsubishi. It is defined as VS-74 of October 2007. It is intended for use by Authorized Service Centers ONLY. The Service Tip is Copyright @2007 Mitsubishi Digital Electronics America, Inc. I will not post VS-74 on this thread. The cure to the Blinking Green Light, according to VS-74, is to replace C9B01, C9B02, C9B10 and C9B11 (1000uf,16v) on the DM PCB with Mitsubishi part# 181P734030 (680uF,16V). VS-74 makes NO reference to Temperature rating. VS-74 provides NO explaination for the change in capacitor rating and Mitsubishi Technicians, Mitsubishi Authorized Repair Centers and others, with circuit design expertise, with whom I have discussed this issue, DISAGREE with VS-74. It suffices to say: DISREGARD VS-74 and REPLACE the defective Capicators with those having a rating of: 1000uf, 35v, 105C. Check your techlore (PM) private message box for messages from me. Then reply by PM. Thanks. Thanks for the solid information that everyone can work with. It's nice to have the exact information. I've seen that several people have been able to get a Factory rebuild for this Cap issue and they state that a lot (50-100) caps are changed. Does anyone know (or can go in and read) what capacatance, voltatge, and temperature, are used in DM positions on those chassis' that came back from Mits. Factory rebuild? For those people lucky enough to get the Mits factory rebuild. I wanted to write a note to you to say Thanks for all your help. I replaced the convergence IC and two 5amp pico fuses on my power bd. and it WORKS. The picture looks good and and I reset my convergence settings back to factory default. And I didn't need to make any further adjustments.I couldn't have done this without your help and the TechLore website. So again thanks to you and the whole TechLore family. The important thing is that your television is once again working. I'm glad that I and the Techlore team was able to help in some small way.